Thanks to a $4,000 grant from Athletes for Animals, First Coast No More Homeless Pets (FCNMHP) will offer 80 free spay/neuter surgeries for large breed dogs living in Duval County. The Athletes for Animals Spay Neuter Sprint program offers free spay/neuter for all Duval County residents with large breed dogs who weigh or are expected to weigh 40 or more pounds. The innovative program stems from research showing that most puppies coming into shelters are large breeds and it can be difficult to find homes for them. FCNMHP is one of the largest spay/neuter clinics in the country, having performed more than 240,000 surgeries to date. Last fiscal year we performed 20,000+ spay/neuter surgeries. “The average cost of spay and neuter can be cost-prohibitive to low-income residents and can be a barrier to getting this vital procedure done. This surgery is an elective and some veterinarian offices can charge up to $400 for a large dog spay and $150 for a neuter. 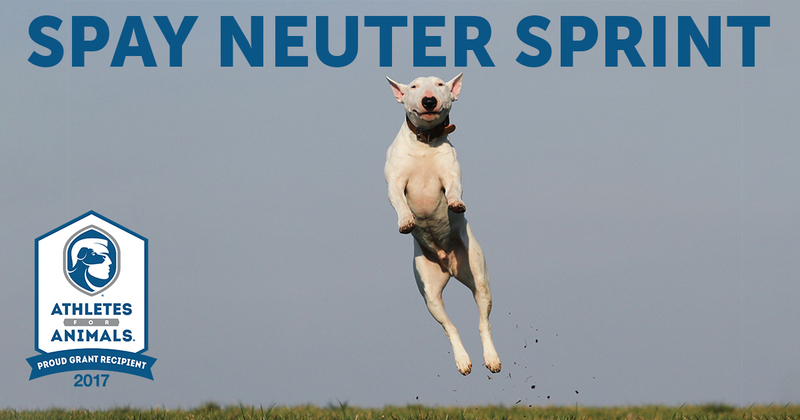 Keeping pets from ever entering a shelter is what spay/neuter is all about. That way they can never become a statistic,” said Jennifer Barker, FCNMHP Chief Operating Officer. Dogs must be over 4o lbs. or expected to be over 40 lbs. Athletes for Animals is a united team of professional athletes with a shared passion for rescuing and protecting the welfare of homeless pets nationwide. Our Athlete Ambassadors represent sports teams across the nation and are leveraging their public platforms to make an impact on the lives of homeless companion animals. They help us broadcast the messages of pet adoption and responsible pet ownership, including the benefits of spaying/neutering, by lending their voices to our cause, volunteering at local shelters, attending fundraisers and making charitable donations. We believe that providing accurate information about homeless pets will help current and future generations make informed decisions about their animals, leading us to a more humane pet population.